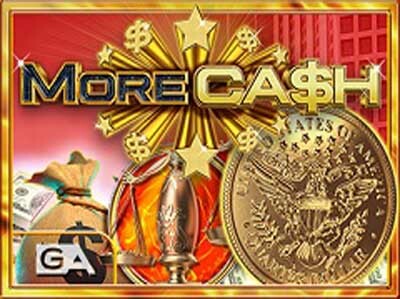 More Cash is a brilliantly flamboyant online slot game by software manufacturer GameArt. The theme centers on the world of wealth and cash in any shape or form. The backdrop is a bright red, but you can also make out a tall, modern building and what appears to be Wall Street – the financial heart of the world. Even the symbols here are also mainly money-related and picture cold hard cash, gold bars and credit cards. In addition to them, you will also see a piggy bank standing over a pile of coins and a fat bag full of money and a $ sign on it. Finally, there are also the lower value playing card symbols A, K, Q, J, 10 and 9. There are 5 reels and 3 rows here in total and 15 paylines. You will notice that the amount of paylines is fixed, so you won’t be able to control it. However, you are free to adjust the amount you would like to bet per line. This will leave you with a betting range of 15p per spin up to £7.50 per spin. More Cash has a pretty decent RTP of about 96%. 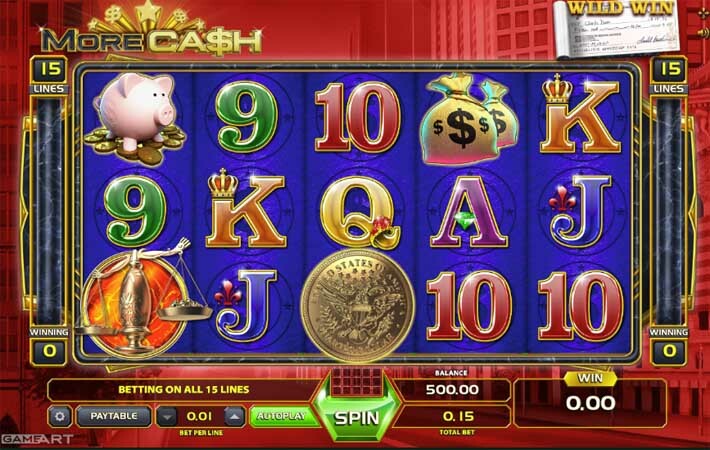 This slot game features two whole special symbols on its reels. The first of them is the coin symbol, which is the game’s Wild. It can appear in any position on the reels and replace any of the regular symbols, save for the Scatter. That way it will allow for better winning opportunities. However, your best aim would be to have the Wild land on the middle three reels 2, 3 and 4, when forming a winning combo. Depending on the number of the reel that the Wild lands on, your wins will be subject to a multiplier of the same number. And if you land a winning combo on two of the middle reels, the multipliers will add up. As for the Scatter symbol, it’s in the form of a scale and will offer you payouts without having to land on a given payline. However, that is all it does. Unusually, the Wild symbol is actually the one that can activate the bonus feature. In order to do so, you will need to land 2 or 3 Wilds on adjacent reels 2, 3 and 4. This will award you 10 or 20 freespins, respectively. What’s more, on every spin you can benefit from an extra Wild that will randomly appear on the reels. And better yet – if it land on the 1st payline, it will also expand to cover its entire reels. And finally, you will also be able to retrigger this bonus feature the same way as you activated it in the base game. This will award you an additional 5 freespins. More Cash is fairly simplistic, even though triggering the Bonus feature may seem a little unusual at first. In addition, wins can also be fairly rewarding thanks to multiplier feature.